New neighborhood contact center in Manila Philippines saves employees 2-3 hours in daily commute time, enhancing engagement and customer satisfaction. This is something that hasn’t been done before. . . We take note of this very innovative approach to put contact centers in the neighborhood. Qualfon, a mission-driven business process outsourcing (BPO) company and global provider of contact center services, received a vote of thanks and congratulatory applause from the Vice Mayor of the City of Manila Philippines, the Deputy Executive Director of the Philippine Department of Information and Communications Technology (ICT), and also from the Corporate Secretary of the Contact Center Association of the Philippines (CCAP), all of whom were in attendance at the Qualfon Manila grand opening ceremony held on August 4. 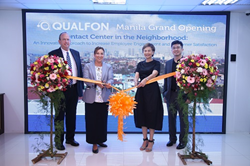 The event celebrated Qualfon’s neighborhood contact center strategy, an approach strategically designed to put jobs in the residential district of Paco saving employees 2-3 hours per day in commute time and enhancing engagement and customer satisfaction. Tucked into the 4th floor of the Robinsons Otis Shopping Center in an area known as Manila’s University Belt, Qualfon’s neighborhood center is conveniently located where people live and study. “Qualfon’s new center is very different from your typical contact center because it’s in a different place. As a result, our agents are less stressed, more engaged, and make customers happier,” added Marrow. Operations are already underway at the 35,000 square-foot contact center, where employees currently provide customer support services in the communications industry. The center can employ 1,200 people when at capacity, and Qualfon is currently hiring in the areas of customer care, technical support, sales, and customer retention programs. For more information visit http://www.qualfon.com/careers or email JoinUsManila(at)Qualfon(dot)com.